Marchettino - The ONLY official website: The 1st F12 Berlinetta crash! The 1st F12 Berlinetta crash! The Ferrari F12 Berlinetta is having a great success, deliveries have just started, and if you want to buy one you have to wait over 1 year. But with 740hp and the RWD, we didn't had to wait so long to see the first F12 Berlinetta crash. And the award goes to **drum roll** ... a chinese man. The crash took place on the Jiefang Bridge in the city of Guangzhou, looks like the owner of the F12 hasn't done a good use of the massive carbon ceramic brakes, and the result is a collision with another vehicle, and a damaged front bumper and hood to be replaced. The car was just 3 days old, and in the following pictures it doesn't even shows a registration plate, and I doubt that it had an insurance. 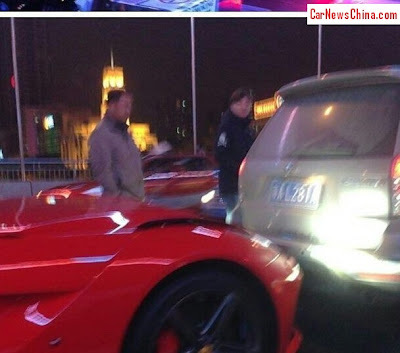 This is certainly not the only Pracing Horse involved in a crash in China, recently also a 458 Spider and a California have been smashed. See the article of the double crash here. Porsche 997 GT3 RS Close Call! Idiots drifting in the middle of the HIGHWAY! What a lap! The Huayra at Top Gear! Reventon vs GT-R vs 1098! Reventon Roadster and Veyron SS WRE!